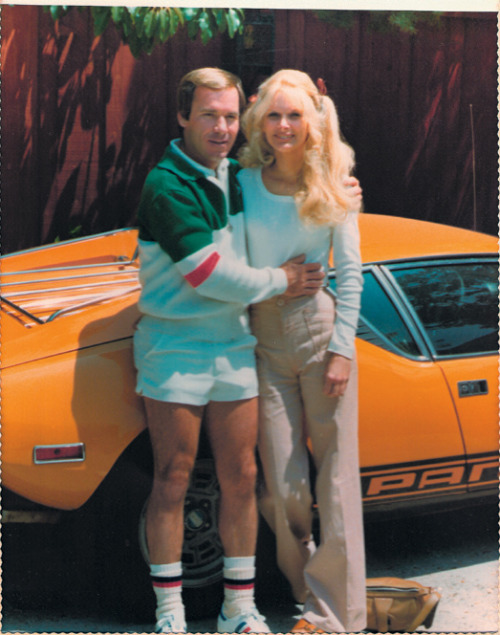 If you're as old as me you certainly remember the stylish neckties of the seventies! You know... those wide polyester ties with the big bold patterns? 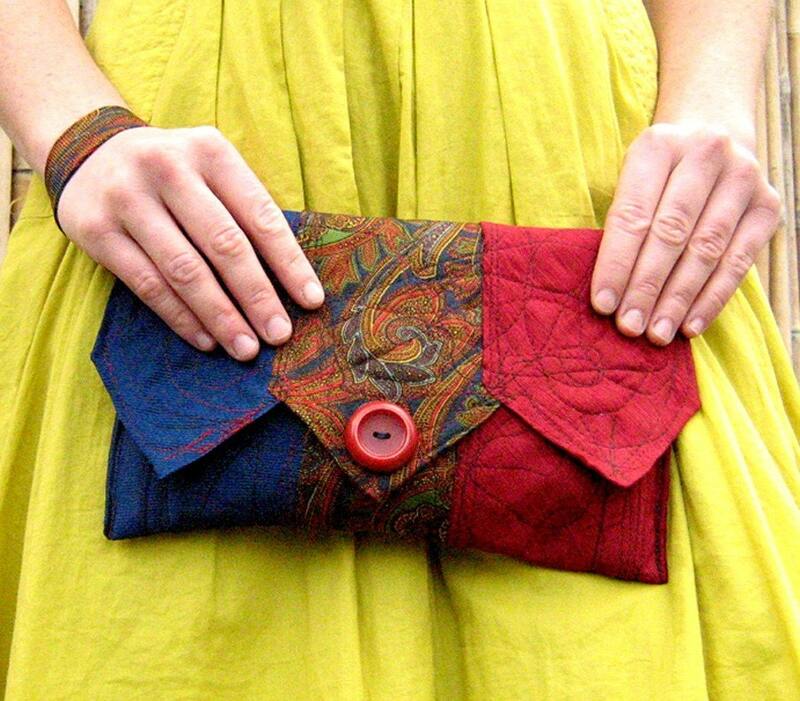 I love how fellow etsian andsometimesy has upcycled them into these cute clutches and wallets. Dotted with funky vintage buttons too. Sweet and very JUST COOL! 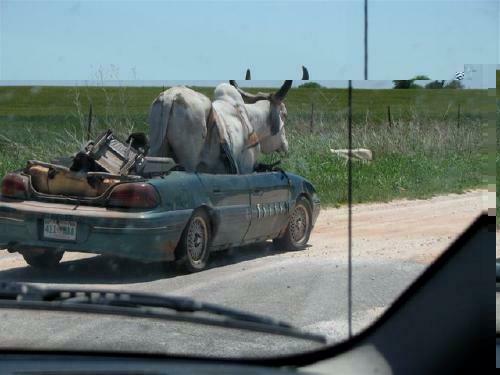 Yet another reason why they have to bring motor vehicle inspection back in Oklahoma - to keep bulls from riding down the road. Presentation is everything and this photo sure makes these simple minimalist pots look like something very special. And they are! Bambinas are super cute handmade pastel/white colored vessels, slipcast from Matauri Bay clay , native to New Zealand where the maker Zakiah Heath calls home. The wee Bambinas are double cast and high fired, then sanded and left unglazed. They look beautiful on their own or in a cluster, perfect for a dinner table, mantle or window ledge. They can also be used with a tealight candle inside or as a vase. 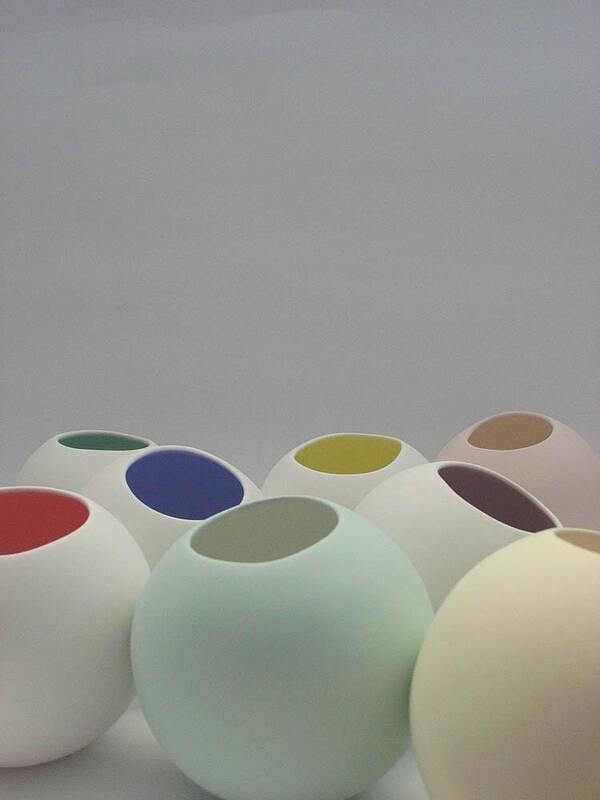 Each Bambina measures approximately 10cm in diameter. $26. Find them at Zakiah's Popkraft Etsy Shop. Still it's fun and JUST COOL! holiday decorating : o xmas tree! From fellow etsian Middleburg's shop - Winter Night Trees set of three. "These remind me of dusk in the winter, when trees look so dark, cool and green against the white snow. Made of heavy-weight muslin, hand-cut and dyed. Reclaimed wood is used for these bases which have been white washed. These are signed pieces. Mix or match them with our other style trees for an eclectic, country look in your home this holiday season." $84. Christmas greenery that is JUST COOL! Meet Jerry. 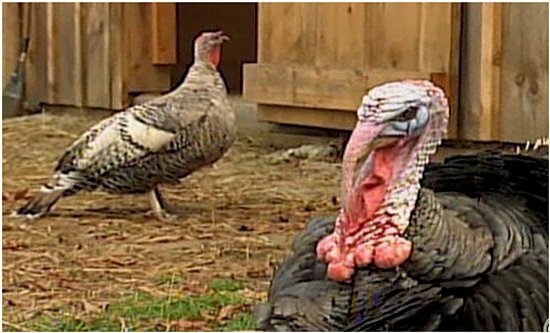 Lyndsey Medeiros and her husband adopted the three-year-old turkey and his girlfriend Penelope from a Rhode Island farm last week. But Jerry has cataracts, and his eye problems mean he can't eat independently or join his female companion, for fun and flying. Medeiros has posted an ad on Craigslist seeking donations for the surgery. She said the procedure could cost up to $2,600. Her farm in Rehoboth, Mass., cares for other animals with health problems. "My husband and I rescued a 3 year old Turkey from an add on craigslist last week. I realized that he had a bluish tint to his eyes, he walked into things and had a hard time eating and drinking on his own and after brining him to a veterinary opthamologist it was discovered that he has cataracts that can be corrected with surgery. We would not be even contemplating surgery for Jerry unless it greatly improved his quality of life, but right now he needs full assistance to eat and drink and is pretty sedentary because of his lack of vision. Unfortunately surgery costs upwards of $2600, which is a little out of our reach for us for an animal that otherwise possibly would have ended up on someones dinner table. 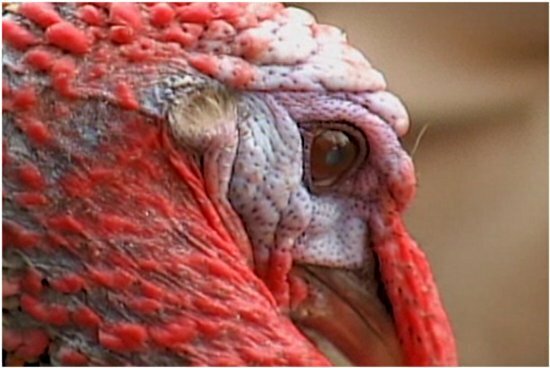 We are accepting donations to go towards Jerry's surgery and care afterwards..." So, if you are interested in not eating but helping a turkey this Thanksgiving, then go here to reply to the craigslist ad. And BTW, we're skipping the turkey this year and eating lobster. YUMMMMM. Craigslists - WEIRD very WEIRD - but JUST COOL! 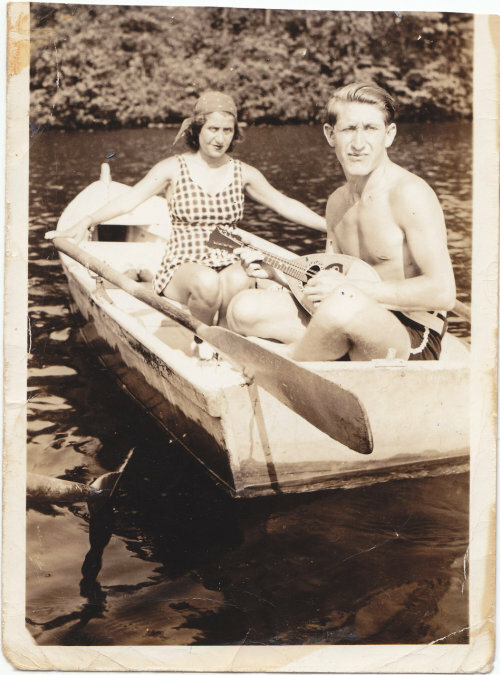 Check out the blog here - it's JUST COOL! 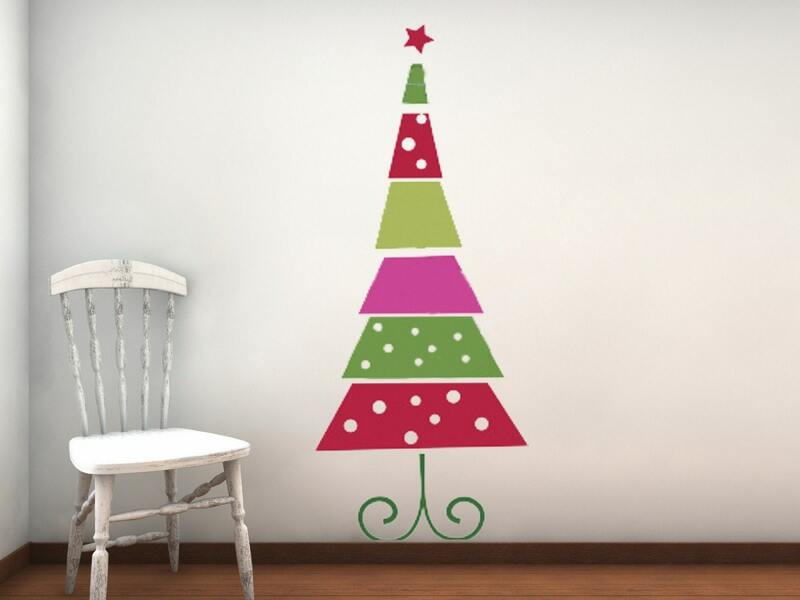 design :: oh christmas tree! Love this idea! It's actually a decal that you put on the wall. What a great way to give any spot in your home a festive look at Christmas! And it isn't permanent either- just peel it off and pack it away until next year's holiday season! Found it over at fellow etsian's Circleline Studio's shop. You can customize it with your own colors too. $62. Soooooooo JUST COOL! cool product :: share your photos the easy way! I just discovered the coolest product!Perfect for me because selling on eBay and Etsy , I take A LOT of photos with my digital camera and am constantly uploading them. Plus, I love to snap photos of everything and everyone where ever I go! But no matter how much I love TAKING photos, I can't stand the tedious, time consuming task of uploading them first to my computer and then to the internet. But now theres a quicker way to upload photos right from my camera and directly to the web and I can be anywhere to do it too. It's a little memory card called the The Eye-Fi card and it's the first wireless memory card ever invented. It stores media, fits into digital cameras and even looks just like a regular SD/SDHC card. On top of that, the Eye-Fi card has built-in Wi-Fi that uses your wireless network to effortlessly transfer photos and videos.It automatically uploads your photos and videos to your computer and to the web. You can choose from 25 websites, including Flickr, Facebook, Picasa and more. It stores a whopping 4 GB of photos - thats up to 2000 photos and almost any digital camera is compatible with it. Sounds cool? You can read more about it at the official Eye-Fi website and watch the video here. Now I'm thinking of what a great gift this will be for my picture taking friends, family and everyone else on my Christmas list (including me!). This product is definitely JUST COOL! The challenge with conventional watering cans? Ensuring that the water hits its target and not everywhere else.. They're also pretty unsightly, so why not make a watering can thatlooks like a work of art too? 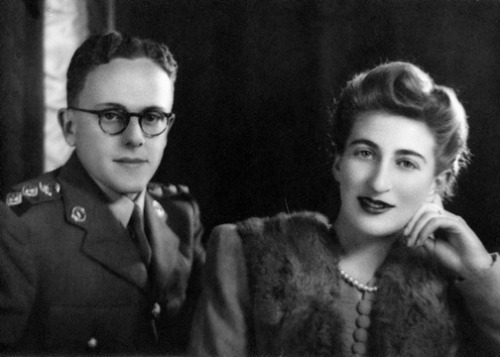 French-born Pascal Charmolu came up with the antidote: This beautifully streamlined, practical design. Made of 18-0 stainless steel, this can features a flexible silicone hose with a built-in magnet that allows it to be attached to the can’s body when not in use. When watering your plants, simply hold the metal cylinder with one hand and the hose in the other. Move the metal cylinder up or down to cease water flow. Pascal is the other half of Born in Sweden, a new design house from Europe that has just opened up in the North American market.A pretty slick looking watercan, don't ya think? Now the only problem left is which color to choose? games :: RAVENSWORD at the app store! iphone :: RAVENSWORD released today - at app store now!! "Apple must have expedited the reapproval of Crescent Moon Games' Ravensword as it appeared in the App Store early this morning for $6.99. Similar to recent Elder Scrolls games like Morrowind or Oblivion, Ravensword is an open world roleplaying game with both a main quest line to follow and a considerable amount of side-quests. The developers have quoted anywhere between 6-8 hours of gameplay to complete the initial quest without taking side-quests into account. The Ravensword game world is surprisingly detailed for an iPhone game, and performs remarkably well. Along the way you will equip your character with all kinds of different magical items and slay hordes of enemies as the main quest line slowly reveals your character's mysterious identity." So people, this spectacular RPG game is just another reason to go iPhone! 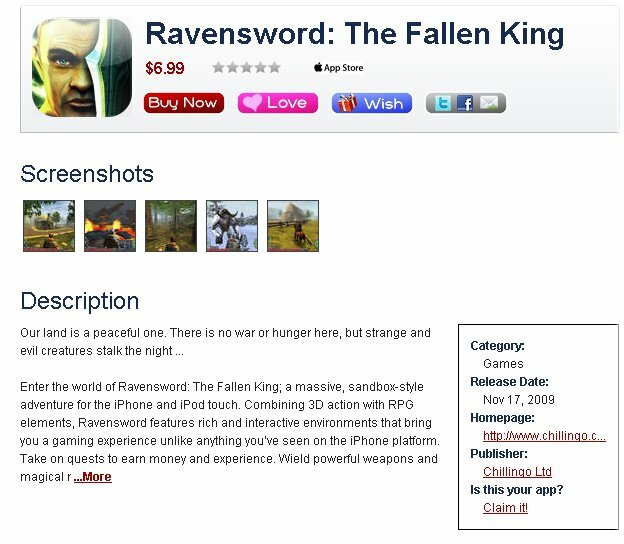 You can buy RAVENSWORD : The Fallen King - iPhone's most ambitious roleplaying game at the Apple Store. It's only 6.99 and of course JUST COOL! 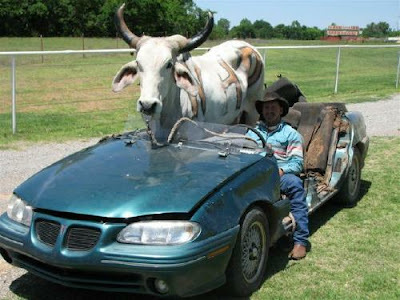 Off to buy mine now, so later peeps! I love my iPhone and I won't go anywhere without it. With it, I can be anywhere and still have practically everything I need right at my fingertips!Internet, phone, my music, the weather,gps system, a ton of apps and much much more. But I have to admit I am not crazy about the sound quality. Whoever designed the tiny muffled speaker in this jam packed mobile phone wasn't too smart in that department. So was I happy when I saw that Yamaha has come out with an awesome speaker dock where you can park your iPhone (or iPod) and enjoy your iPod/iPhone games, music and movies wirelessly from anywhere in the room. The powerful Yamaha PDX-60 Speaker Dock uses exclusive Yamaha yAired (tm) wireless technology so you get Instant connection with no sound delays and quality sound with deep, rich bass. The convenience of dual charging means two separate iPhone or iPods can be charged at the same time, one using the dock on the speaker and another on the included charging cradle. This awesome product practically turns your iPhone into a mini home theater system! With easy to use features such as a speaker that can be placed in any out-of-the-way location, easy operation (auto power on/off and volume control sync), a transmitter unit small enough that you can carry the iPod/iPhone around and talk on the iPhone with the transmitter attached, a cradle for setting the iPod/iPhone on a table, etc. and low power consumption it has it all! AND did I mention it even looks great with a choice of four color variations to match your iPod and room! Isn't technology, especially this technology JUST COOL? Or have Don Hutchings do it for you. 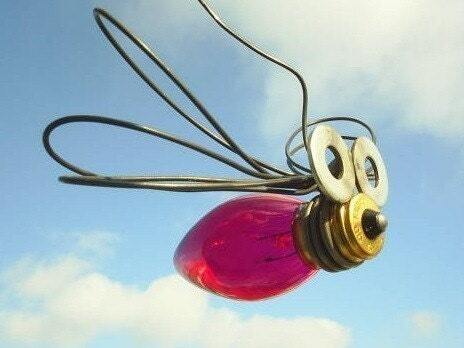 "Glass Christmas Light bulb made in to a dragonfly bug using old and found items and old wire welded to make this great little bug 3 x 4 inches and has a hook for hanging Many colors to pick from just ask Don Hutchings FREE SHIPPING TO SEE COLORS GO TO blackcrowforge.com!" Check out Don Hutching's Black Crow Forge in his etsy shop too! Sure, bugs can be JUST COOL! Without a doubt, homemade Halloween costumes are far superior to generic ones bought in the costume shop or at the store. 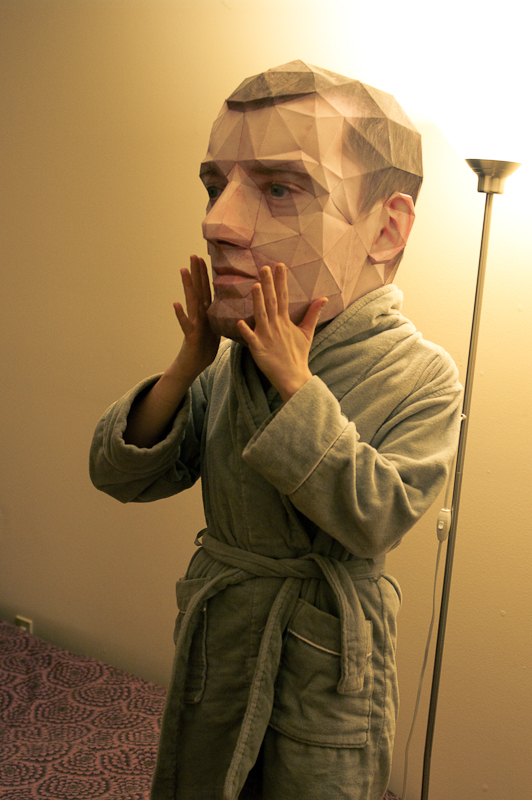 Artist Eric Testroete proves that with his "this years" halloween costume. 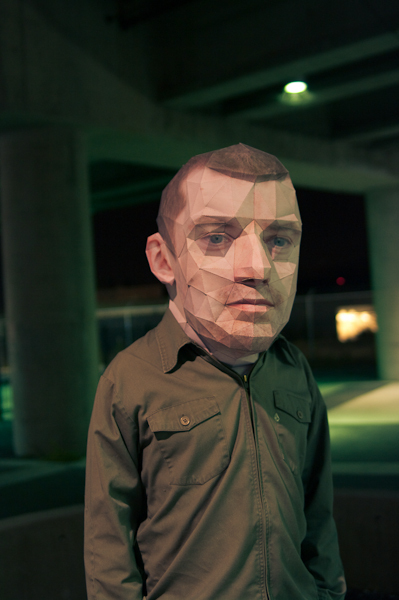 He created his own head in cartoon-like BIG HEAD mode and made it entirely of paper. 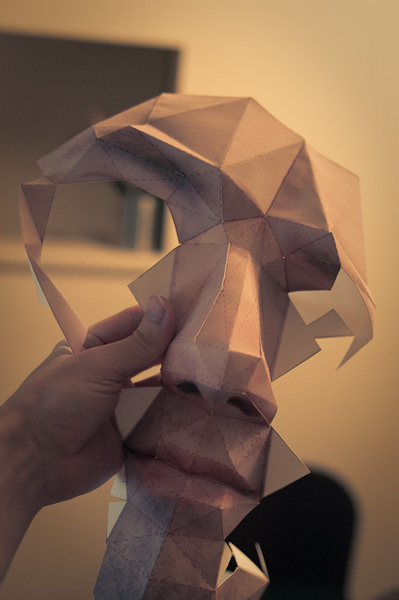 Using graphic software including 3D Max, he designed, modeled,printed and folded this faceted paper mask to go over his head and tuck under his jacket. Seems like a mighty intense process but the result? A very cool Eric in Wonderland effect. WOW! 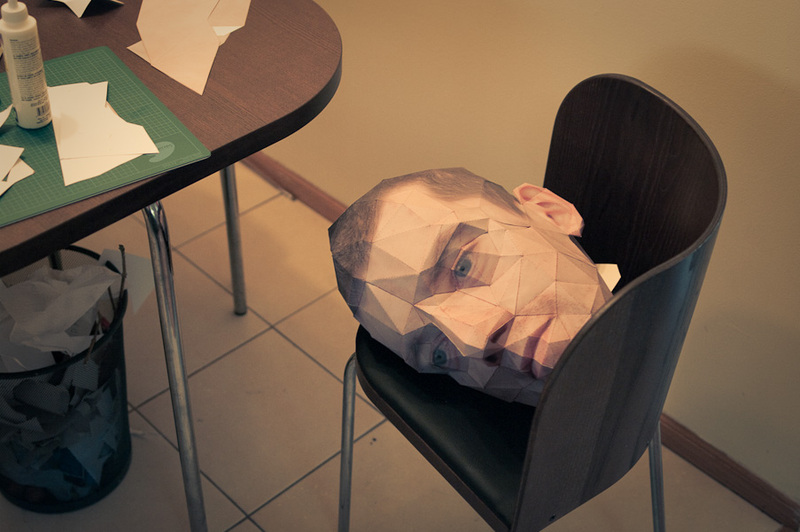 Check out more of Eric's unusual art projects in his portfolio online. They're JUST COOL! This "Mistral" staircase by Stiller is not only functional but has beautiful design sense as well. The "floating" stair treads give the illusion of walking on air! Check out more unusual and JUST COOL staircases at the Siller website. Art :: your very own blue car christmas! It's that time again. Christmas is in the air! This painting was featured on the cover of last Christmas' NATURAL AWAKENINGS Magazine and I have received so many wonderful comments and requests on it that I am now offering it in my Vintagewarehouse shop on Etsy as this years special customizable painting to include your family, your pets and your house colors! Sure to make a unique and treasured addition to your home. Or order for a thoughtful and personalized gift for your friends and family on your Christmas list! About this painting - "This nostalgic painting was inspired by many childhood Christmases spent at my Grandparents' cozy old victorian house in the Catskill Mountains in Upstate New York! 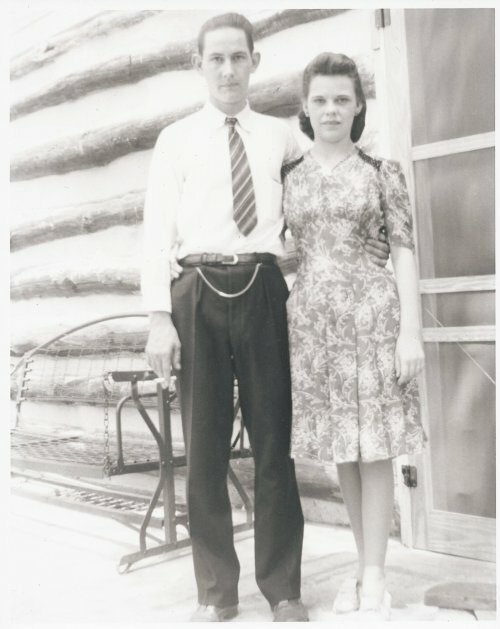 That's our 1958 pink and blue Ford Station Wagon car but instead of driving to get the tree, we would actually trudge up onto the mountain and chop one down for the living room. Usually a lopsided scraggly "Charlie Brown" tree that looked beautiful once it was up and festooned with shimmery old fashioned glass ornaments, ropes of glass beads and dripping with silver tinsel. Underneath the tree Granny always had a little town of micah covered cardboard houses, a mirror "skating rink" and lead skating figures. 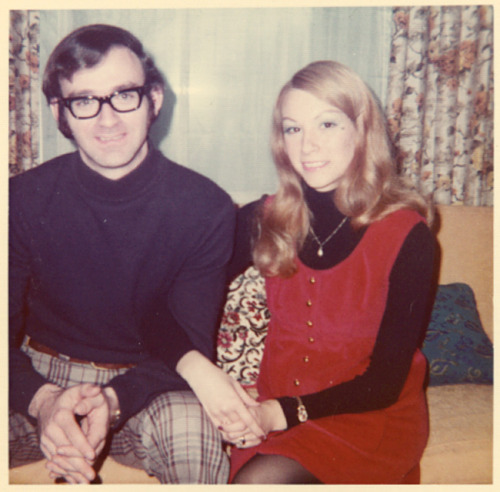 Christmas time was always such a magical time for us up on Schunnemunk Mountain! Good memories!" Your painting will arrive within ten days to two weeks after placing your order. I am taking a limited amount of orders so everyone will get theirs in this time frame. So ORDER NOW! 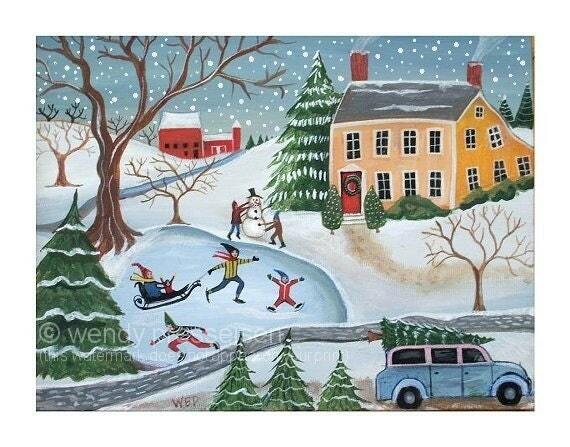 My signed fine art print of BLUE CAR CHRISTMAS is also available for purchase. How genius is this? 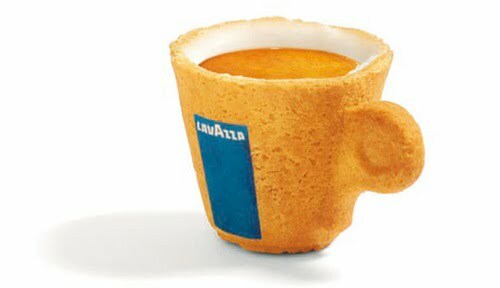 The Cookie Cup was designed by Venezuelan designer Enrique Luis Sardi for the Italian coffee company Lavazza. This incredible edible cup brings ecofriendly "recycling" to another level with it's tasty design. A green solution and innovative way to drink your coffee and eat the cup, thus no cup to wash or another nonbiodegradeable cup for the landfill. The Cookie Cup is made of pastry covered with a special icing sugar, which works as an insulator, and makes the cup waterproof, hence allowing you to use the cup to drink your coffee in, and then finish off with a tasty biscuit! why buy a davy crocket hat when you can grow one? It's not only the hair that inspired People of Walmart blog - but there are Walmart bellies, butts and clothing that will have you on the floor LYOA! Its JUST COOL!